“The boycott begins tomorrow. Yellow placards, men on guard. Pressure [on Jewish employers] to pay Christian employees two months salary [and] to dismiss Jewish ones. No reply to the impressive letter of the Jews to the President of the Reich [Hindenburg] and to the government… No-one dares make a move. The Dresden student body made a declaration today… the honour of German students forbids them to come into contact with Jews. They [Jews] are not allowed to enter the Student House. And how much Jewish money went toward this Student House only a few years ago? In Munich, Jewish university teachers have already been prevented from setting foot in the university. “On Saturday, red posters on the shops: ‘Recognised German-Christian Enterprise’. 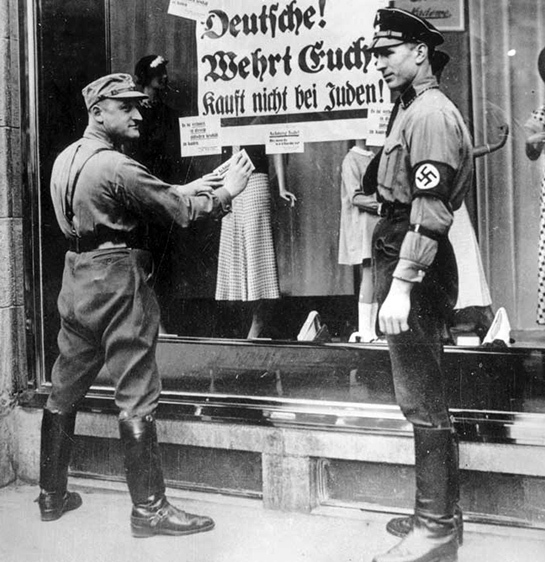 In between them, closed shops, SA men in front of them with triangular boards: ‘Whoever buys from the Jew supports the foreign boycott and destroys the German economy’.